This Rose Otto bar, from Rococo Chocolates (London) -- made with smooth, Organic milk chocolate -- was redolent with natural rose flavor. 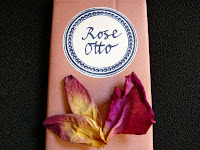 While it might be too floral for some, I really appreciated being able to actually smell and taste the roses today, and would happily buy this bar again in the future. Today was Day #7 of Chocolate and Flower Theme Week; however, I'll be extending this theme week for a few days, as I really enjoy floral flavors. And, thankfully, there are many different chocolates available in this category to try.